Tyler Texas was a pretty fun place to be. Tyler is a decently sized city (home to over 100,000 people) and always had events going on. Plus, it had just about every restaurant that we love, so we spoiled ourselves going out to eat! We actually stayed outside of a town called Bullard, which is south of Tyler. It was nice to live near the city but not in it (and to not have to deal with city traffic if we didn't want to!) Joel worked in a town called Jacksonville, which is South of the town we lived in. All in all it was pretty convenient to live in the middle of Joel's work and the fun stuff to do in Tyler. We checked out Stanley's Famous Pit BBQ by recommendation from an OH/TX/back-to-OH friend (: And to say we fell in love, might be an understatement. I cannot even tell you how many times we ate there. We would plan on eating out, and when it came to deciding where to go, we would say something along the lines of "Yea, we could eat there, and it might be pretty good, OR we could go to Stanley's where we KNOW it'll be amazing!" So we usually went to Stanley's (: This place is really cool, and if you didn't know about it, you might just drive right past it! (Unless you happened to notice the MASS amount of vehicles parked in their dinky front parking lot.) They have some indoor seating, but most seating is on their patio area, part of which can be enclosed and heated when necessary. Stanley's regularly has live music and happy hour too! We both usually got the same things: me, the mother clucker sandwich and a side of potato salad, and Joel the two meat plate with brisket and ribs. I don't think we ever had a bad meal there. And we even celebrated our 3 year wedding anniversary there! Basically, if you're ever in Tyler, you NEED to make it a point to eat here. You won't regret it. Another place we tried by recommendation, that instantly became a favorite. We had both been kind of iffy about "frozen custard" because... well, it just kind of sounds weird? But, and it kills me to say this, I MAY prefer Andy's Frozen Custard over ice-cream!!! Joel tried a few different things on our many trips here, his favorites being the apple pie concrete and the original Straw-Ana. I did get a concrete with cookie dough once, and even though it was REALLY good, I usually ordered a shake with hot fudge blended in. I'm seriously making myself crave Andy's now, it's just really good, people! 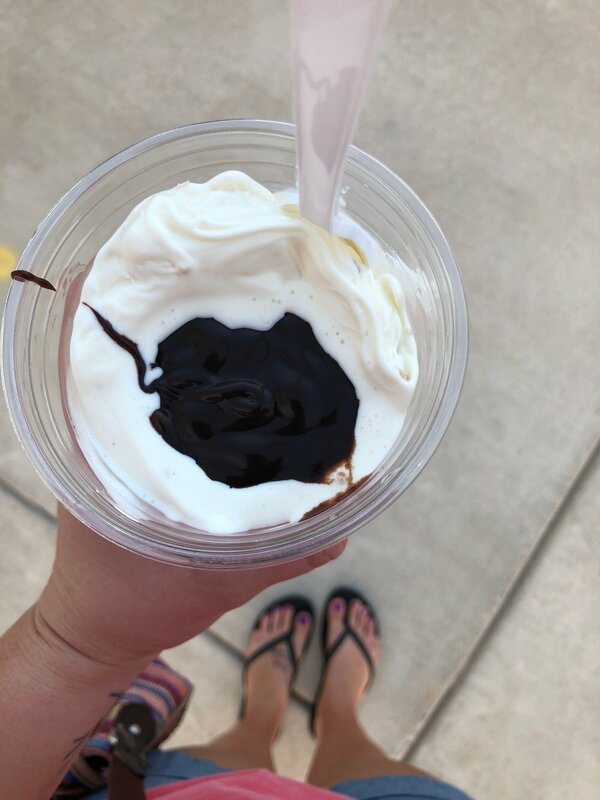 They offer a huge variety of menu items and flavors, so if you ever get the pleasure to stop by an Andy's Frozen Custard, I'm positive you'll find something you'll love. This one we tried too late, because I became addicted to their lavender iced tea, our LAST WEEK in Tyler (insert crying emoji) I had heard of this place, but we just hadn't tried it out. 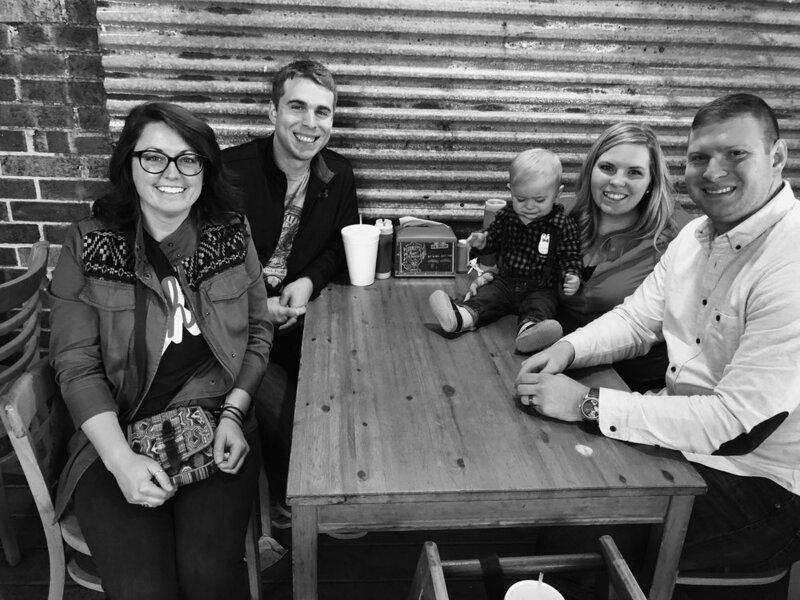 When our friends from Shreveport came to visit one weekend they stopped here for a caffeine fix and told us how awesome it was. So, one afternoon while searching for good wifi, I ended up at the Foundry Coffeehouse. And probably drank a pitcher of iced tea with their housemade lavender syrup. I then of course had to bring Joel back (must.get.more.lavender.tea) and we tried some of the pie they had that day (They have pie Friday's or something like that, and I think we had a piece of what was leftover? but it was really good) Joel got some ridiculously hipster drink (that he hated, and forced himself to drink because it was like $4 hahaha) but I did let him take a SMALL sip of my tea, which of course he loved. This is a really cool place (although very hipster and I got some rude looks when I came in wearing my non-hipster attire), has great wifi, free parking across the street, and delicious housemade drink syrups. M6 Winery is located in Bullard, Texas, which is where we lived. This little winery is so cute, and the owners are even cuter! They are so friendly, and made us feel very welcome. We did a regular tasting, and also had a wine/chocolate flight, with different wine and chocolate pairings. We had a hard time "rating" the wines we tried, because we liked just about all of them! We really enjoyed our afternoon here, listening to live music outside, and drinking all of their yummy wine. M6 Winery also holds events like wine/paint nights, cookie decorating classes, and often live music. ANOTHER place we wished we had checked out sooner! Tyler State Park is REALLY nice, featuring a large, BEAUTIFUL lake! The park has walking trails, nice camp spots all around the lake, and I believe you can rent paddle boats, etc there. We spent an afternoon here with the dogs walking and exploring, and we really enjoyed ourselves. Actually, we have really liked just about every Texas State Park we've visited during the almost 3 years we've been traveling. We were in Tyler/Bullard in the fall, and we (I) was really excited when I found a "pumpkin patch" near Bullard! Moore Farms is located outside of Bullard, and offers seasonal hay rides, a few fall-isa activities while you wait for the hay ride, a corn maze, and a "pumpkin patch." I use quotations because I'm fairly certain that the pumpkins that we picked/saw did not grow in the field that we found them in. Having grown up in farm-town-usa, it was surely an odd experience, but fun none the less. I do not know too much about the Tyler Rose Festival, but it's a several week long event (I believe) which is kicked off by a parade (which we missed) and what can only be described as a pageant maybe? We went to the local Rose Garden, where the festival royalty were on display following the parade. I'm pretty sure we were the only non-local people there (and also the only people who had no idea what was going on) The festival royalty were decked out in some crazy impressive dresses, all of which had a different "theme." My favorite was the solar system one! The Rose Garden was very pretty, and I think is open to the public on most days of the year. K.E. Bushman's is an RV park located on US 69 (one of the only main roads out of Tyler) The RV park is located next to K.E. Bushman's event center. It says online, and on the camp map, that this is their "winery" but, it is in fact not a winery, just a large event center. Our spot backed up to the side of the event center, and we were rarely bothered by any of the events held there during our stay. The park has paved roads to all of the sites, and partially paved sites which was pretty nice. All of the sites seemed to be really level. We enjoyed the hot tub, pool, having nice paved places to walk the dogs everyday, onsite laundry, and it seemed like a fairly safe place. I would say the only downsides to this RV park would be that it's a little pricey and that they are not the most flexible (which can be expensive for us, and just a pain, towards the end of an assignment if we don't know exactly when we're leaving/what we're doing) All in all though, we would stay here again if we were in the area.